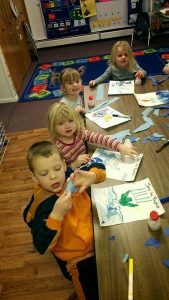 Our goal and responsibility at St. Paul Lutheran Preschool is to provide a uniquely Christian educational setting in which young children, from within the congregation and throughout the community, can learn and develop physically, spiritually, intellectually, emotionally, and socially. Our staff is excited to work with parents and children to provide a safe and loving environment where relationships with one another and with our Lord are formed and strengthened, thereby providing each child with a solid foundation to meet the future challenges and opportunities that await them in life. For more information, including registration inquiries, please call (231) 258-9258 and visit us at our Facebook page https://www.facebook.com/stpaulkalkaska.